April 10th us Encourage a Young Writer’s Day. While it’s not a typical holiday, it is a fun one that is meant to inspire children to celebrate writing and pursue a passion. Maybe you already have an avid writer and are looking for ways to enrich their writing even more. 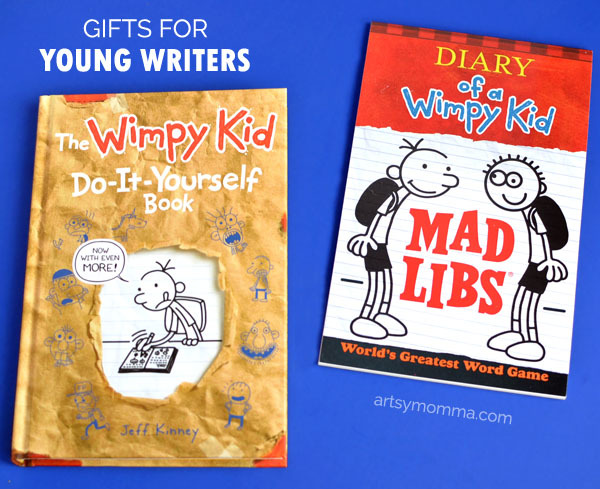 These gift ideas for encouraging young writers is meant to do just that. 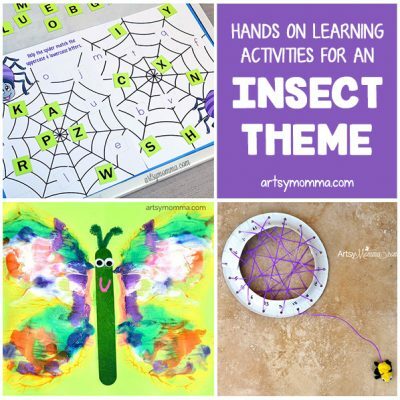 There are so many ways to customize with different supplies and books…. and it’s adaptable for preschoolers all the way up to teenagers! 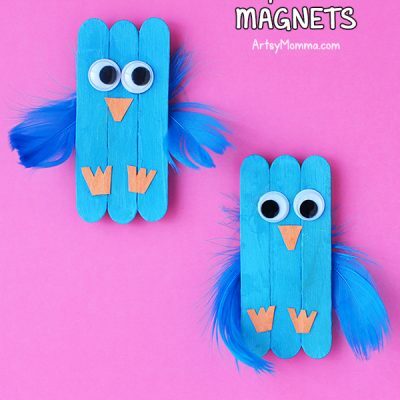 Add your own creative flair to make it extra special for your little one. Big Brother (8) writes pretty much daily for a couple years now. He is forever folding a stack of paper in half to create books. I can’t even count how many little books we have that are written by him, usually about race day, penguins, or Wipeout. He also enjoys doing fun facts and all things related to countries. 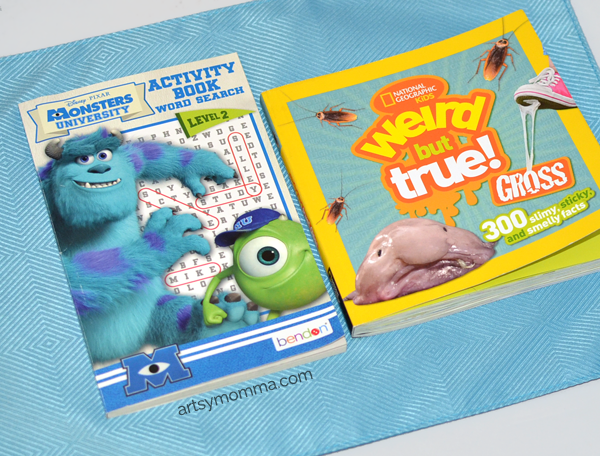 I found a way to incorporate both interests into his surprise gift with a coloring book and a weird and gross facts book – great for taking their writing beyond what they already know, even to another country! *This post contains Amazon affiliate links. I am also part of the Xyron Design Team. Please read our full disclosure policy here. 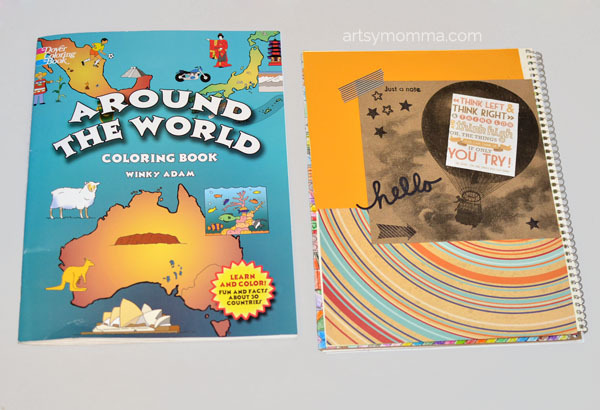 Around the World Coloring Book – includes fun facts and country info. 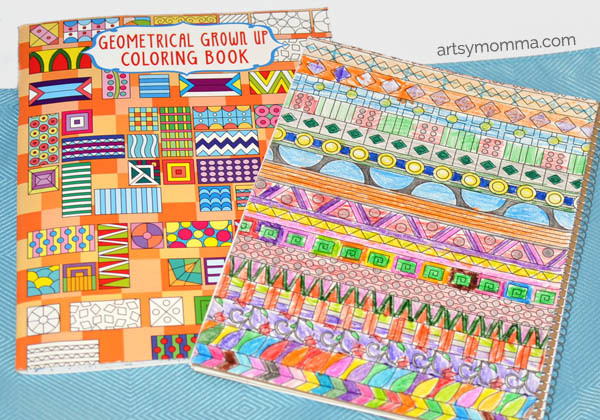 Adult/Kids Coloring Book for inspiring creativity and relaxing. The geometric shapes coloring book was purchased at Dollar Tree. A composition book works best but any notebook will do, even those mini notepads . 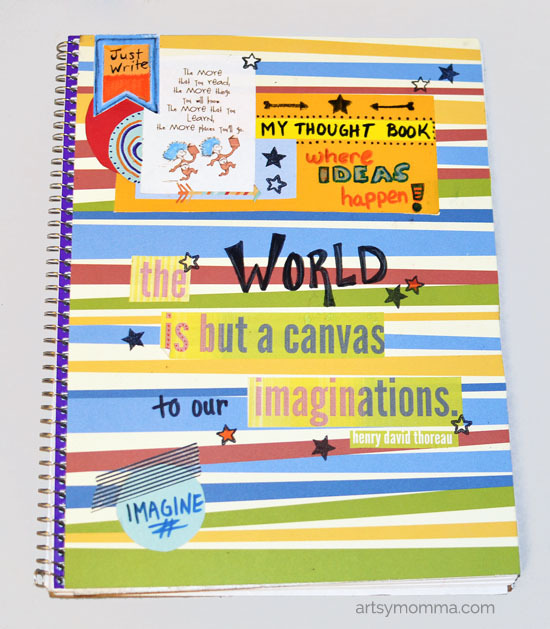 Search online for inspiring quotes about writing to print or stop by the scrapbook aisle to grab items for decorating the notebooks. Visit the Xyron website for more great supplies! You’ll also need cardstock for covering and layering your designs. 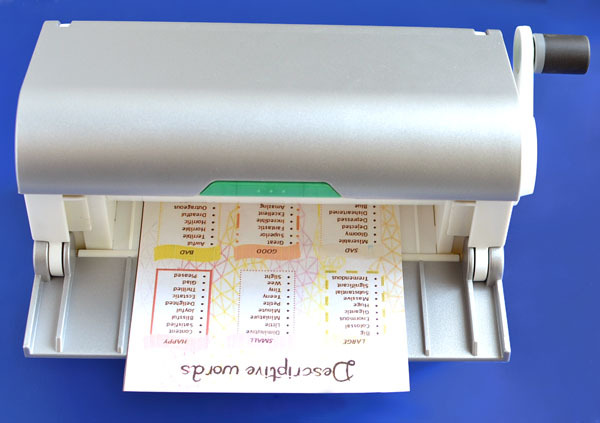 After you cut all your quotes about writing out, send them through your Xyron® Creative Station . It makes your quote into a jumbo-sized sticker! This is great because it doesn’t make the paper bubble or cause sticky glue to get on your fingers plus it’s acid-free! Regular glue may make your quotes bleed depending on the type of paper used. For simple embellishments, I used our Diamond Press to make die cuts of stars, arrows and letters. Once all your pieces have been made into stickers, it’s time to lay out your designs for both the front and back covers, including the inside covers. Chose 1-3 main patterns or colors to use for each cover and cut them accordingly. 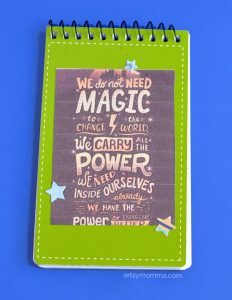 I ran these through the Xyron® Creative Station as well and they easily stuck to the notebook. Play around with your pieces. When you get a design that you like, peel off the paper backing from your homemade stickers and stick them in place. 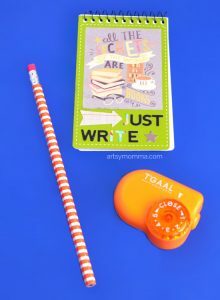 Quotes, stamps and ink, die cut shapes and letters as well as markers used to embellish and write words on. On the back cover is a kid version of an adult coloring page. 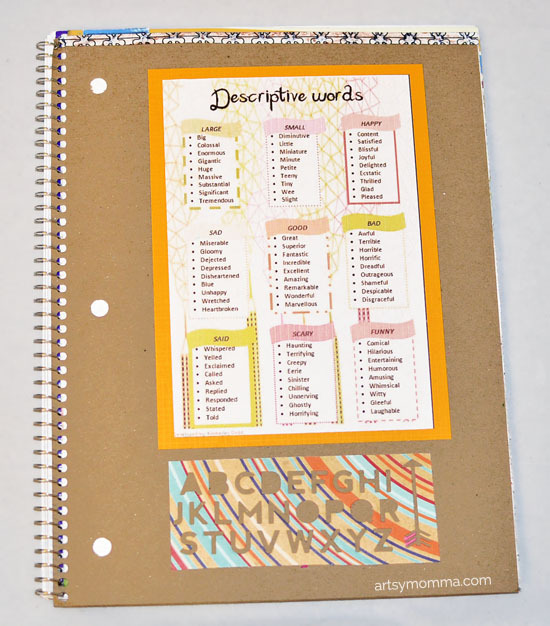 Inside the back cover is a Descriptive Words chart for other ways to say common words. – My Thought Book….where ideas happen! Don’t forget to hold onto to their finished journals and notebooks for when they become famous authors 😉 I left a spot on the inside cover of our decorated notebook for him to write his name and age plus the year. How do you celebrate writing? 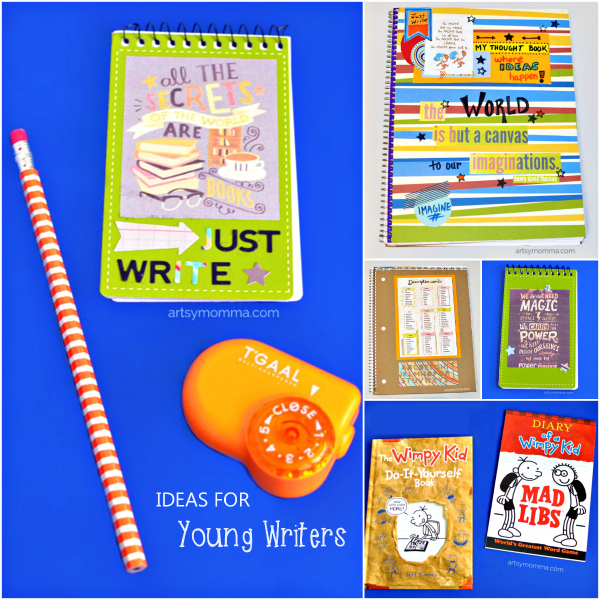 Have anything to add as a gift for encouraging young writers? I’d love to hear your awesome suggestions! Just add a comment below, thanks!